We will develop a system that shares data and computational resources in a cloud environment (or other externally hosted system). With these services integrated, researchers will have the data framework through which to better understand the causes of and gain insight into possible treatments for various diseases and conditions. We will focus on enabling authenticated access to secure data and analysis modules across institutional boundaries, a prerequisite to productive collaborations among institutions that host large biomedical data repositories and computational infrastructures. The PIC-SURE team is developing an Application-Programming Interface (API) that will allow the CCD team to access the Autism Simons Simplex Collection (SCC) dataset through simple REpresentational State Transfer (RESTful) calls to obtain data for causal analysis. The proof-of-principle federated data ecosystem that will be developed can serve as a model for how other institutions share biomedical data and analytic services in a secure and scalable manner in a cloud environment. Aim 1: Deploy and test the PIC-SURE RESTful API in the cloud. Aim 2: Develop probabilistic graphical models in a cloud environment. 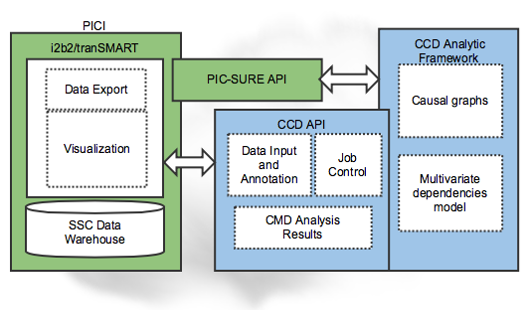 Aim 3: Develop and test a cloud-hosted version of the CCD analytic framework. Aim 4: Develop and test PIC-SURE data visualization tools with CCD models in the cloud.